Functional selectivity of G protein-coupled receptor signaling. Canonical signal transduction through GPCRs occurs via activation of their namesake heterotrimeric G-proteins that will then continue signal transduction by second messenger systems. 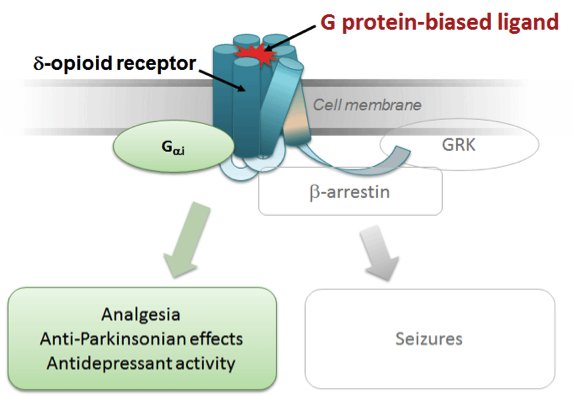 Between 1990and 1992 two arrestin proteins were discovered, found to interact with GPCRs and named for their ability to stop signal transduction of β-adrenergic receptors (β-arrestin 1 and 2). Additional investigations revealed that β-arrestins can not only discontinue signal transduction, but also initiate signal transduction by interacting with and activating different protein kinases and transcription factors. β-arrestin1 and 2 share ~78% sequence homology and while early studies revealed a certain degree of functionally redundancy for the two β-arrestin isoforms, continued investigation revealed subtle differences and unique capabilities for the β-arrestin isoforms. Potential for developing more efficacious therapeutics through biased signaling. 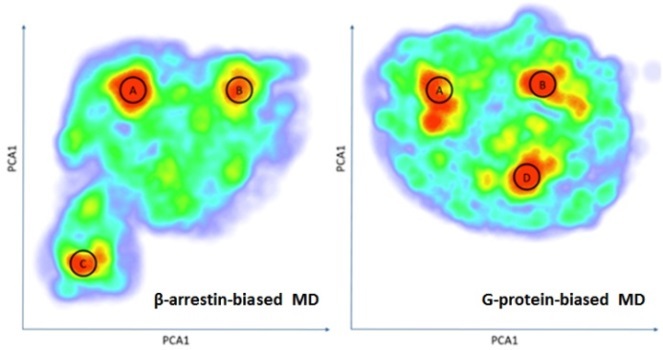 Increased appreciation of the divergent signaling pathways of GPCRs allowed for the reassessment of GPCR antagonists as β-arrestin agonists, and identification of G-protein selective agonists devoid of β-arrestin activity. These pathway selective agonists, primarily referred to as biased agonists, have been shown to be therapeutically active and display a limited adverse side-effect profile due to their signaling selectivity. Biased signaling at opioid receptors, including the δ opioid receptor. Investigations into biased signaling of δ opioid receptors (DOR) have revealed that DORs can interact with both β-arrestin 1 and β-arrestin 2 isoforms. Strong recruiters of β-arrestin 2 promote internalization and degradation of DORs, whereas weaker recruiters either cause internalization and recycling or no internalization at all. Degradation of DORs has been linked with behavioral tolerance. We recently found that β-arrestin 2 recruitment efficacy was tightly correlated with a DOR agonist’s ability to either decrease or increase alcohol intake in mice. DOR-mediated signaling via β-arrestin 1 has been implicated with autoimmune disorder like ulcerative-colitis and mechanical allodynia. Discovery of novel signaling-biased δ opioid receptor agonists. In our drug discovery efforts to produce novel δ opioid receptor selective drugs that can be used to treat neuropsychiatric disorders we aim to dissect the behavioral functions of β-arrestin 1 and β-arrestin 2-signal transduction pathways. To accomplish this goal one of our strategies is to develop β-arrestin 1-biased DOR agonists and β-arrestin 2-biased DOR agonists. We are currently screening compound libraries to identify DOR compounds that either recruit β-arrestin 1 or β-arrestin 2. We also collaborate with Dr.Markus Lill to perform an in silico drug screens using computational models of DOR optimized for binding to Gi-biased-, β-arrestin 1- and β-arrestin 2-biased agonists. Additionally, we can validate our β-arrestin-biased agonists in β-arrestin 1 knockout and β-arrestin 2 knockout mice. Figure: Compound library screen to identify signal biased DOR agonists. A, Screen for compounds that inhibit forskolin-induced cAMP production in HEK293-DOR cells. B, Screen for compounds that are weak recruiters of β-arrestin2 in CHO-DOR/ β-arrestin2 cells. C. Plotting screened compounds for both tested parameters reveals biased DOR agonists. Figure: Schematic diagram depicting probability for finding protein in specific conformation projected along the first two PCs. State C is only sampled by β-arrestin2-biased agonist, while state D is sampled only by G-protein biased agonist. For this project we collaborate with Drs. Markus Lill, Mark Cushman, Julia Chester, Amy Brewster and Susruta Majumdar. We have also collaborated with Dr. Kevin Bender at UCSF on an aspect of β-arrestin-mediated signaling transduction of calcium channels.